These interfaces are rack-mounting or slimline, desk-top intercom stations with analogue ports for linking Green-Go intercom groups to external analogue intercom systems or other audio equipment. They communicate over the network with other Green-Go digital intercom stations. Each station is connected to a network switch using standard Ethernet cabling. They can be powered over the network if the switch provides power over Ethernet. The 1U rack-mounting GGO-InterfaceX is a useful combination of two channels of 4-wire to 4-wire together with a single channel of 2-wire to 4-wire. The 4-wire interface offers two channels of analogue in and out. Uses include linking to an external matrix intercom, injecting program audio on to the Green-GO network and sending analogue audio to an external PA system or show relay. The 2-wire interface offers a single channel of robust interfacing to popular partyline systems including Clear-Com, RTS-TW and Tecpro. Two GPIO connections are also included, providing opening or closing contacts to trigger selected functions. 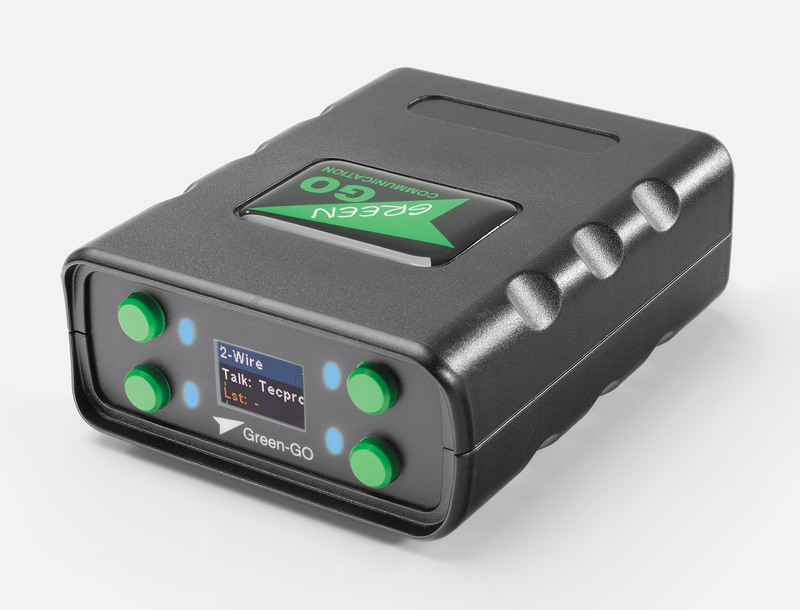 The GGO-Interface is powered by Power over Ethernet or optional 12V power supply. Dimensions: 1U x 150mm deep. Weight: 2.3kg. 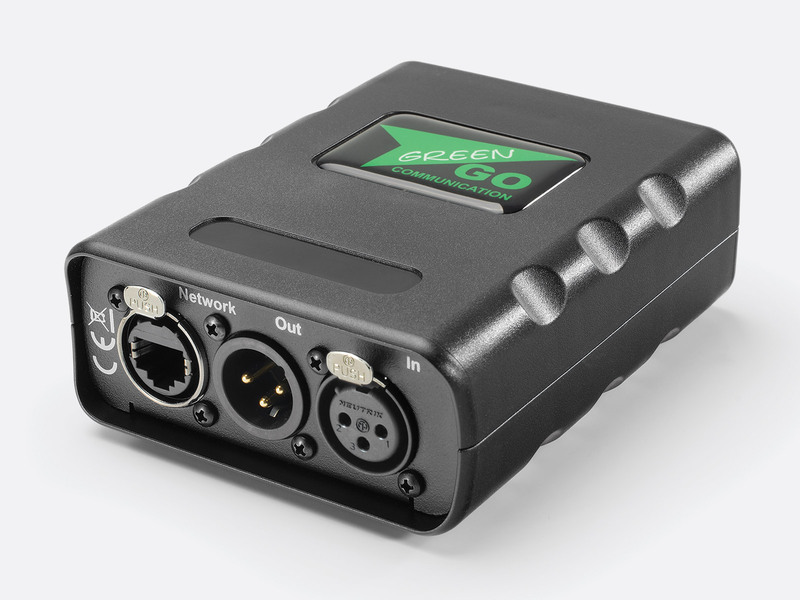 The Green-GO SI2W 2-Wire Audio Interface is a compact, single channel interface for integrating analogue party line systems with Green-GO digital intercom. ‘Call’ signalling will pass between both systems together with ‘Announcements’ and ‘Program Audio’. Ideal for integrating a Green-GO DECT wireless system with existing Tecpro, Clear-Com, RTS-TW and similar analogue comms. The SI2W interface will link to a single channel of analogue intercom. If linking to two or more channels is necessary, additional SI2W interfaces will be required. When Linking to RTS-TW, due to the pin configuration, only channel B is connected. An adapter cable can be easily made to swap from channel B to channel A - see cable connection info at the end of this product description. The SI2W integrates robustly with analogue party line comms, providing a clear, echo-free, low noise, low latency link. For theatre applications where there is little sound reinforcement, whispered instructions will be heard clearly by the operators. If hum and hiss from the analogue partyline is noticeable, a noise gate can be activated to help minimise system noise. The compact SI2W can be plugged into any convenient 3-pin XLR access point on the analogue intercom ring. It will draw no current from the comms line as it is powered by PoE (Power over Ethernet) supplied from a suitable network switch. Four green buttons on the front panel provide access to the menu where the device can be set up for best audio performance. Information is displayed on the full colour Oled screen. Note: poorly installed audio cabling can result in high levels of hum and noise being present on analogue party line comms. This may make it difficult to null the system correctly. The SI2W Quick Start Guide can be downloaded by following the product resources link. 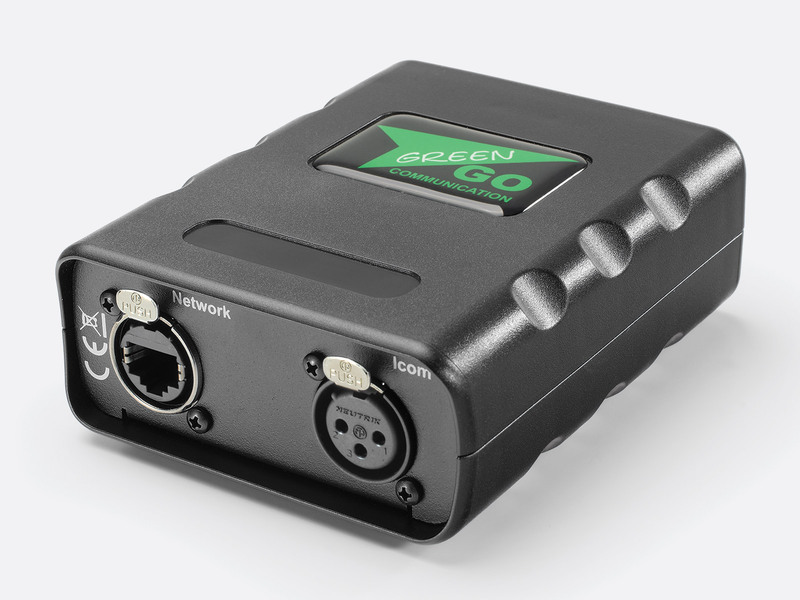 The Green-GO SI4W 4-Wire Audio Interface is a compact, single channel audio interface for importing and exporting analogue audio to and from the Green-GO digital network. It can act as a general purpose line in/out device suitable for show relay and announcements or for linking to an external matrix intercom channel. Alternatively, in ‘User’ mode, it offers access to 32 intercom channels and to program audio. Four buttons on the front panel provide access to the menu where the device can be set up for best audio performance. Information is displayed on the full colour Oled screen. The SI4W interface has two modes of operation. For normal interfacing duties, it should be set to ‘Line In/Out’ mode. This is suitable for inputting programme audio material or show relay on to the Green-GO network, sending analogue feeds to external audio systems or for linking to an external matrix intercom. ‘User’ mode provides additional options suitable for sending IFB audio to a wireless transmitter for presenters. This includes selectable sources for Program Audio which can be adjusted in level and set to dim or mute when the Director or Show Caller talks to the presenters. This mode is also suitable for sending show relay to green rooms and dressing rooms. The default sampling rate of the Green-GO system is 16kHz, giving an upper audio limit of 7kHz. This is eminently suitable for speech, while minimising data use. If there is significant high frequency content in an audio source (for example music) being fed on to the Green-GO network, the sample rate of the SI4W’s A-D convertor can be doubled to 32kHz, increasing the upper audio limit to 14kHz. To link to remote sites, a single SI4W interface can be used to connect over the internet to a remote Green-GO intercom situated anywhere in the world. To avoid using a local bridge unit, bridging functions can be carried out at the remote Green-GO site and the SI4W set to ‘Remote’ mode. This would make it possible to link another manufacturer’s intercom to a remote Green-GO system using a single, dedicated group. The Quick Start Guide can be downloaded by following the product resources link. Note: Green-GO products are only available for sale to customers in the UK and Ireland.